As many of you know, this past year was a busy one for me between writing Ukulele Exercises For Dummies and continuing to provide support and instruction in my online ukulele course Ukulele Strumming Tricks. To celebrate and reward myself, I treated myself to a new ukulele made by my friend, the master and world-renowned luthier, Mike Franks. Needless to say, I’ve been really enjoying the new ukulele (! ), and I wanted to tell you all about it. I’m also getting a lot of questions about it after playing it in one of my recent video lessons 5 Effective Strumming Patterns for Beginners, which I hope to help answer here. 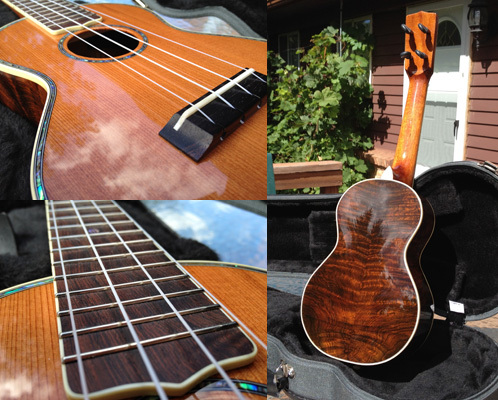 For the last couple years, I’ve been playing a mahogany tenor-sized ukulele crafted and made by M.J. Franks (read about that here). I love the tenor size because it’s great for my larger fingers and hands, and it’s pretty versatile because you can tune it to low G tuning. This gives the ukulele a deeper, fuller sound. I think the tenor ukulele often sounds the best in low G tuning. The problem I’ve run into though is that I want low G tuning, but I also want the ability to play in standard tuning. There’s something about standard tuning that gives you that classic ukulele sound. I’ve known for awhile that I’ve needed to get another ukulele to have the best of both worlds. Since I’ve had such a great experience with my M.J. Franks tenor ukulele, I called up Mike Franks last year to see if I could hire him to build me a custom concert-sized ukulele. The great thing about working with Mike is that you can customize a ukulele exactly to your liking. If you aren’t sure what you want, just let Mike’s expertise guide you. Needless to say, Mike pulled out all the stops on this one! I can honestly say this ukulele is one of the finest crafted and best sounding instruments I’ve ever played. As you can tell, this is quite a special instrument. It has exactly that classic ukulele sound I was looking for. It’s bright, lively and warm. 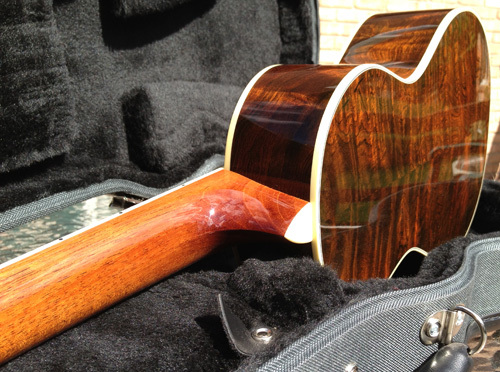 The tone is crisp when strummed and crystal clear when fingerpicked. The intonation is spot on and it is tremendously easy to play up and down the fretboard (Mike hand-carved the neck and fretboard). 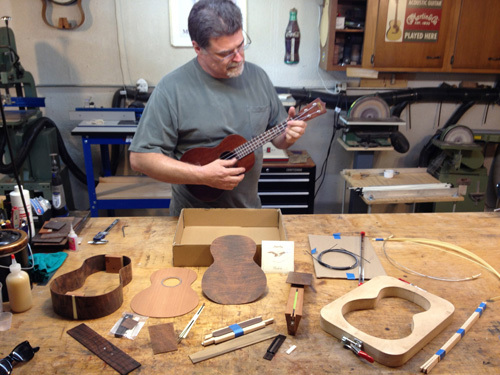 If you are looking to invest in an heirloom-quality, custom ukulele, I highly recommend working with Mike. 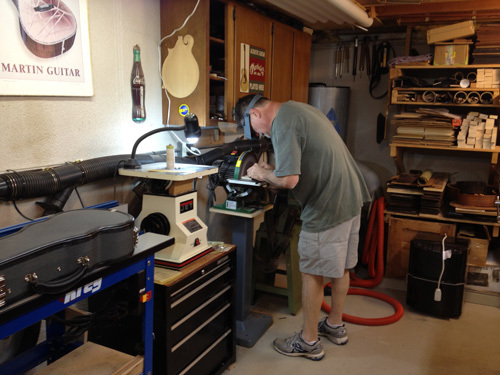 I’ve heard from many of you who have had Mike build you a ukulele and have had a wonderful experience. You can find him on the web at M.J. Franks Guitars, his Facebook page here, or just give him a call at 586-703-2700. 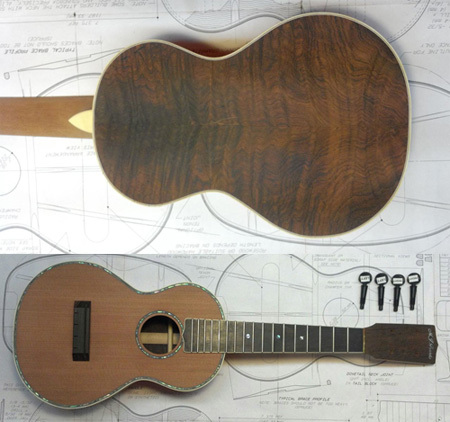 Scroll down for some more pictures of the construction of the ukulele and the finished product from my time touring Mike Franks’ workshop. It’s coming together. This was before the gloss finish was applied. I couldn’t be happier. Thanks, Mike! Brett…you look totally happy with your new ‘ukulele. It’s gorgeous! And you can sing too…Keep it coming, buddy. Very inspirational stuff from you…A Thailand fan. Beautiful instrument. Makes me jealous. You failed to mention the super cool PegHead tuners! How do you like them? You are right! Completely forgot about mentioning those. I can’t remember what kind of tuners they are, but they are awesome. Very accurate and give me a lot of room to get the string tuned to the right pitch. after you described the redwood that was harvested and used as well as the tonal quality-I can only assume that your luthier, Mr Franks, is producing the equivalent of a Stradivarius as far as Ukes go. Congratulations on your books and your success! SOOOO nice Brett, you do deserve it! Yikes! Sorry to hear this. Where did you order it from? Brett, Lovely looking instrument and a clean bright sound. Tell me why you chose friction pegs rather than machine heads – people generally say machine heads are easier to tune and hold the note more successfully. The pegs look lovely, and since they work for classical string players, I’m sure they’re good. Is it just us beginners for whom machine heads are a better choice? Thanks, Arnold, Sao Paulo. Hi Arnold, great question. I asked Mike the same thing. I really liked the look of the pegs, which is why I wanted them, but I was concerned about the tuning. Mike assured me that tuning wouldn’t be an issue. He used some high-quality pegs on the instrument (I’m not sure of the brand). I was surprised by how easy it was to tune accurately and how well the tuning holds. What a lovely treasure! Very interesting! Thanks for sharing! You do such a great job of everything! Nice ukulele Brett. It sounds nice. I might be wrong but the tuners look like they might be the ones called Pegheads, which are a quality tuner. I also enjoy your site and book. Just wished I had a signed copy of it. Keep up the good work. Hi Brett, you made me smile. I loved the song. Thank you for sharing. Congrats on the new custom UKE she is beautiful! This looks absolutely stunning. 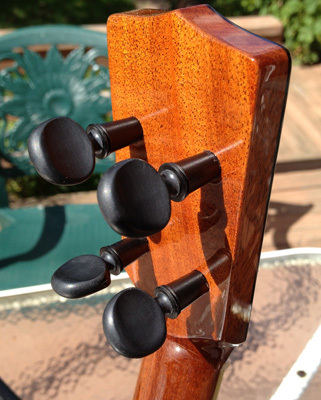 Even more so than some of the higher end Kala ukuleles I`ve seen. Great work! Thanks, Dan! Mike did a fantastic job. I’ve been trying to learn to play an instrument on and off during my entire life without success – first the piano, then the guitar, then the piano again, then a banjo, then Israel’s “Somewhere Over The Rainbow” inspired me to try the uke. At age 62 1/2 I signed up for your online lessons. Six months later I finished Lesson #13, and I can now play a dozen songs cool songs with the chords I learned, and I’m even picking a bit, This weekend I fulfilled my lifelong dream of “jamming” with some musician friends, and I was actually able to keep up! Thanks so much for your wonderful course! Linda, that’s so great to hear! I’m thrilled to hear about the progress you’ve made and the success you are having. Keep up the great work! What a beautiful instrument! It sounds very bright and warm at the same time. I’m wondering if you’ve given our new ukulele a name, as is the Hawaiian custom. 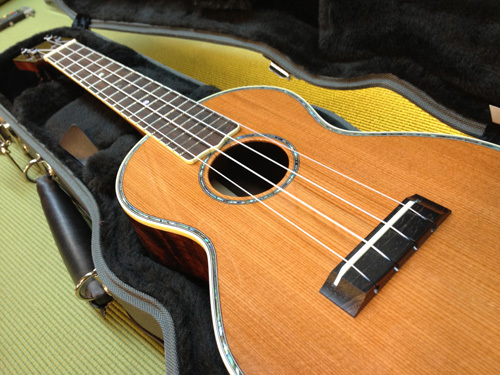 My first ukulele is a Lanikai soprano, and I named it Hau’oli, which means happiness in Hawaiian. It’s aptly named, because that little ukulele has brought me many hours of joy. 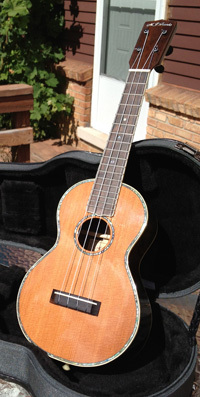 After I’d been playing long enough to know I would want to play ukulele for the rest of my life, I treated myself to a wonderful Maui Music concert ukulele made by Peter Leiberman. It’s my pride and joy. I named it Koa, which means warrior and is also the type of wood it’s made of. Kelli also means “warrior woman” in Celtic, so there you go. Hope your new ukulele brings you much happiness! What a neat and sweet unit! There is something really special about the beautiful patterns on the back of the Uke, and the way that the high gloss finish adds so much more depth to the pattern. I’ve not yet found anyone who could provide a really good understanding of the benefits of using a low G. Each time I see/hear a comparison, they never seem to play the same song (comparing apples to apples). Could you do a video of the same song with a low G? Thanks for everything – particularly your constant enthusiasm. From what I see in the pictures there’s nothing like having your own hand crafted instrument! You’ve got a high quality instrument there. 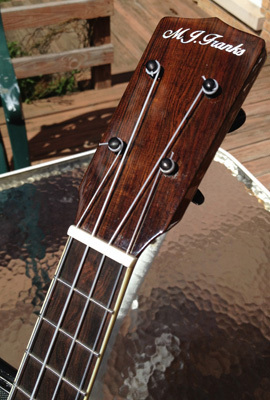 I can tell Mike constructed your uke with great precision and attention to detail. Definitely enjoy your uke with the one of a kind wood it has. New uke, new year! I’m actually a multi-instrumentalist from New York City .Your one of the reasons why I picked up the uke! So I want to say a big thank you Brett! BTW – I clicked on the link to Mike’s website and it timed out, I think you need to add an s after guitar in the url. Thanks, Eduardo, for the compliments on the ukulele! I’m thrilled I could provide some inspiration to pick up the ukulele. Thank you for your kind words. Also, I have fixed the URL link. What key was Ain’t She Sweet in please? I played it in the key of C!